Gentle Pet Care Services will look after all pets ensuring their comfort and safety. Pets will be cared for, and exercised throughout the day. As well, Brenda is able to administer medication your pet may require, including injections. Gentle Pet Care Services welcomes any type of animal — large or small — including cats, dogs, birds, gerbils or fish. Almost any pet, other than reptiles. Gentle Pet Care Services will provide a stress-free environment where all pets can feel right at home. Your furry friend will participate in exercise and playtime. Special kennels will be offered for smaller dogs, as well as dogs that may require their separate area. Music keeps your pet company during the day and at night. We also offer baths, brushing, nail clipping, etc., if requested. 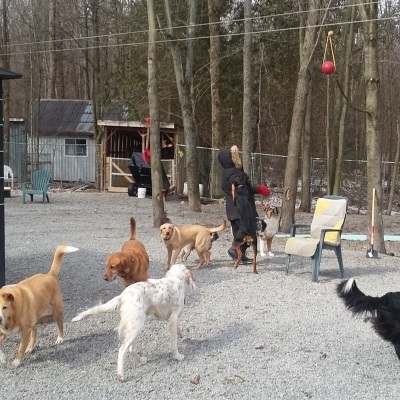 $22 per day, $30 for 2 dogs sharing a kennel (food is to be provided by the pet owner). Prices can vary depending on the dog’s disposition and condition. HST is additional on all charges. We require your dog to have their vaccinations updated. Distemper, parvo, bordetella (kennel cough)and rabies, will be the minimum accepted. Under Veterinarian suggestion, kennel cough will be required to be updated every 9 months . The bordetella vaccine needs to be given 72 hours prior to boarding. Proof of vaccinations to be shown at time of boarding. Gentle Pet Care is a great opportunity to teach your dog important skills for making new canine friends. Call Brenda now at 613-923-5875 for more information. Daycare can be a rewarding experience for your dog. We offer plenty of human interaction and one-on-one attention. Pack interaction teaches social skills and encourages pet self-confidence. Increase your pet's exercise time. Daytime activity can control or eliminate undesirable behaviour in the home due to boredom, separation anxiety or stress. Acceptable behavior is encouraged through positive reinforcement. Your dog is tired but happy when you get home from work — ready to relax the evening away with you. Getting work done to your home and need your pet away from the hustle and bustle. Giving the dog needs a little more attention when you bring the new baby home. Overnights and extended stays are welcome! At Gentle Pet Care Services, we pride ourselves on our commitment to outstanding service and happy pets. Our facility serves as the home away from home for your pooch. Your dog will love you even more for it. Try us today by calling 613.923.5875, or CLICK HERE to send us an email. A quick video clip of the dog run with Brenda in the middle.